Review: I opened the front door on the third ring of the doorbell and found Tessa Nixon standing on my front porch, biting her lower lip and clutching a thick binder and two textbooks to her chest as if they were armor.That is how Tessa appeared at Chloe's house two days before she is found dead in the lake in the novel by Norah McCintock, Scared to Death, which is the third book in the Chloe and Levesque series. Chloe is curious as to how she died and why Tessa appears at her house searching for Chloe's dad, Levesque, looking Scared to Death. 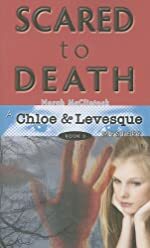 Scared to Death is a book about a girl named Chloe who tries to solve the mysterious death of a girl who goes to her school called Tessa Nixon. Though her stepdad Levesque won't tell her anything she is determined to find Tessa's murderer, especially when her friend Ross is involved. Besides the fact that her schoolmate is murdered Chloe has other issues with her friend Ross getting into trouble and there is something wrong with the people she babysits for. Can Chloe figure it out on her own? I think this book is an amazing story with interesting characters and ominous tension rising throughout the book. Chloe is a smart character who is open to new ideas which, is one of my favorite things about her. She is also the one telling the story. What I don't like is Chloe is impatient and she likes to complain, but that is mostly shown in her thoughts and not her conversations. Levesque is a quiet and grumpy character who is a serious policeman. Ross, who is Chloe's friend and Jake are both suspects in the book. They both liked Tessa and have bad alibis, which make them prime suspects. Also they are both very hard for me to like because they are both one sided and do not listen to anybody. The author has a wonderful use of dialogue, and the conversations reveal a lot about the characters. The best thing about this novel is the plot which is well thought out and has a high level of suspense. The ending wraps up the book completely making it a good stand alone novel in the series. You get hooked right when you learn Tessa's death is not an accident which is only right after the first chapter. I think this book is set at a medium pace until the ending where the action rises. The paranoia looming over Chloe about someone watching her keeps the excitement up throughout the book. I suggest this book for middle school kids and anyone looking for a good mystery. I rate this book a 9/10 because it has an exciting plot but is not the greatest book I have ever read. But, if you read this book the suspense will leave you "Scared to Death".